We analyze a network coloring game on hypergraphs which can also describe a voter model. Each node represents a voter and is colored according to its preferred candidate (or undecided). Each hyperedge is a subset of voters that can interact and influence one another. In each round of the game, one hyperedge is chosen randomly, and the voters in the hyperedge can change their colors according to some prescribed probability distribution. 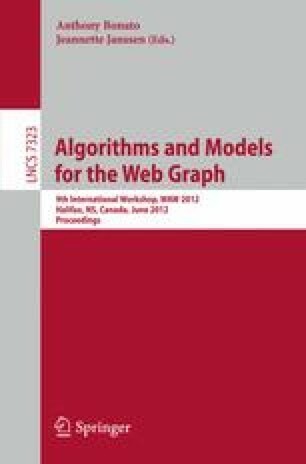 We analyze this interaction model based on random walks on the associated weighted, directed state graph. We consider three scenarios — a memoryless game, a partially memoryless game and the general game using the memoryless game for comparison and analysis. Under certain ‘memoryless’ restrictions, we can use semigroup spectral methods to explicitly determine the spectrum of the state graph, and the random walk on the state graph converges to its stationary distribution in O(m logn) steps, where n is the number of voters and m is the number of hyperedges. This can then be used to determine an appropriate cut-off time for voting: we can estimate probabilities that events occur within an error bound of ε by simulating the voting game for O(log(1/ε) m logn) rounds. Next, we consider a partially memoryless game whose associated random walk can be written as a linear combination of a memoryless random walk and another given random walk. In such a setting, we provide bounds on the convergence time to the stationary distribution, highlighting a tradeoff between the proportion of memorylessness and the time required. To analyze the general interaction model, we will first construct a companion memoryless process and then choose an appropriate damping constant β to build a partially memoryless process. The partially memoryless process can serve as an approximation of the actual interaction dynamics for determining the cut-off time if the damping constant is appropriately chosen either by using simulation or depending on the rules of interaction.